"The Pool" by Jen Lewin is a light installation made of 40,000 LED lights on 106 computer-powered discs arranged in concentric circles. Glass House Collective and green/spaces are bringing an interactive light display to Chattanooga that will be the center of attention at three urban community festivals. Glass House Collective in East Chattanooga is the first of three nonprofit neighborhood organizations to host "The Pool" light show. Highland Park and East Lake will also host festivals and feature the interactive light project this month. › Where: 1900 block of Roanoke Avenue, near Glass Street. › When: 7:30-10:30 p.m. Friday, April 21; 3-10:30 p.m. Saturday-Sunday, April 22-23. › Where: Highland Park Commons. › When: 7:30-10:30 p.m. April 25-26. › Where: East Lake Park. › When: 7:30-10:30 p.m. April 28; 2-10:30 p.m. April 29; 7:30-10:30 p.m. April 30. "The Pool" is activated when someone steps on its pads, so DJs will be on-site at local festivals to get people dancing. Chattanooga will be among just 33 cities in 12 countries around the world to host "The Pool." The installation will come to Chattanooga from the Hong Kong Arts Festival. Night is the best time to experience the exhibit, says Whitni McDonald, Glass House Collective communications coordinator, because "you can see the different colors and it's glowing." 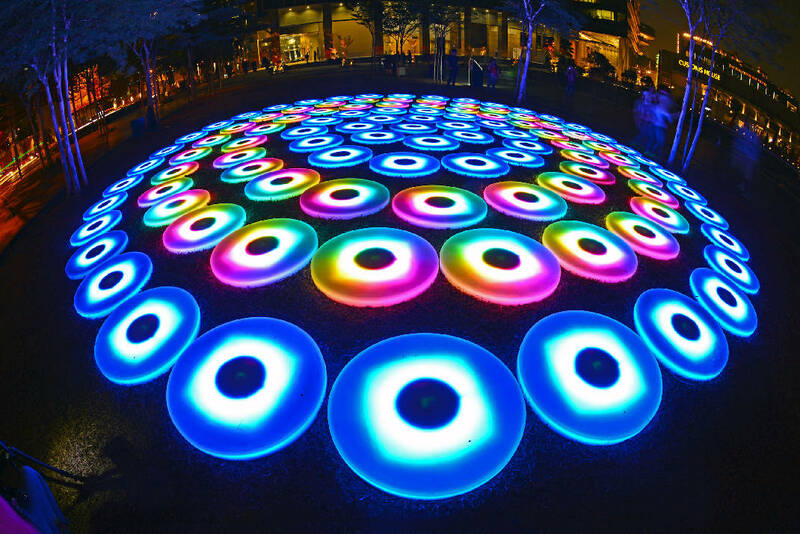 "The Pool" is made of 40,000 LED lights on 106 computer-powered 3-foot discs arranged in concentric circles. Dancing on the discs creates hula-hoop swirls around the dancer. The light show activates when someone steps on pads, setting in motion colored light effects, according to a green/spaces news release. Each of the three communities to host the exhibit has planned its own festival around the project and will have a DJ on-site to get residents dancing so they activate the swirling lights. Glass House Collective and green|spaces are sponsoring the East Chattanooga Highlight Festival this weekend. It will be held Friday, April 21, from 7:30-10:30 p.m. and Saturday, April 22, from 3-10:30 p.m. in the 1900 block of Roanoke Avenue, near Glass Street. Hope for the Inner City is working with Glass House Collective to host Gospel on Glass on Sunday, April 23, from 3-10:30 p.m. There will be a live DJ started at 7:30 p.m., family fun picnic, inflatables, games, vendors and food. The event will offer a host of gospel music from choirs and soloists in the Chattanooga area. World-renowned sculpture artist Jen Lewin named the installation "The Pool" after watching moonlight on tide pools inspired the project, says McDonald. In keeping with the theme of light, EPB will be in each neighborhood sponsoring a light bulb exchange. Residents may bring an old incandescent light bulb to exchange for a free LED bulb while supplies last.